Paint pouring is such a natural process for me. I love the fluidity of a pour and what can be created. Pouring on 3D objects can have many challenges. I would like to dive a little deeper into the process of this pour and preparing the bone for all the glorious color to be applied. Depending on what stage your bone is in, you may have to repeat this process. Begin by taking your unprepared skull and a toothbrush, and add high grade peroxide to the skull. Scrub every crevice possible thoroughly with your toothbrush. This can be painstaking but the outcome will be a nice, clean skull with no remnants of skull matter. 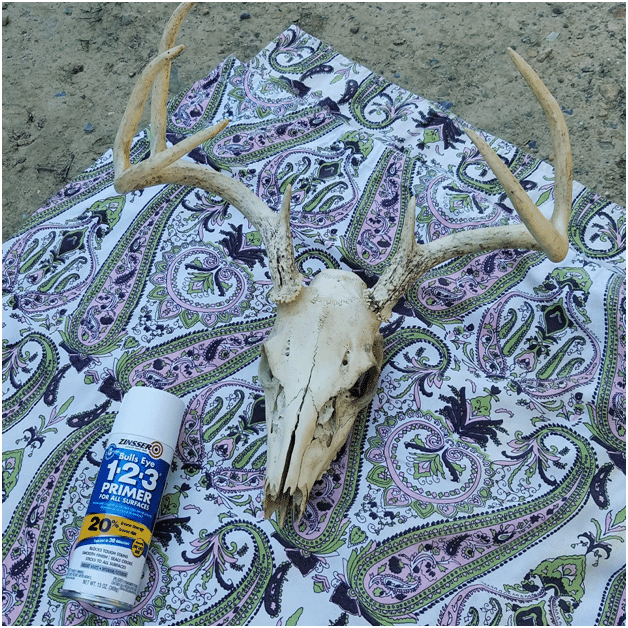 If the matter is left on a skull it can ruin your paint and topcoat over time. When you have finished scrubbing, add one part peroxide and 10 parts water to your bucket and continue to soak your skull for a few weeks. You may have to repeat the scrubbing and soaking process again. If you desire a faster result towards a clean bone canvas, you may apply heat. *Optional: using an outdoor burner, add your mixture of water/peroxide to a metal pot and submerge your bone. Boil this solution checking every 15 minutes or so. Either method will work, it is easier for me to wait and take the time to let it soak. 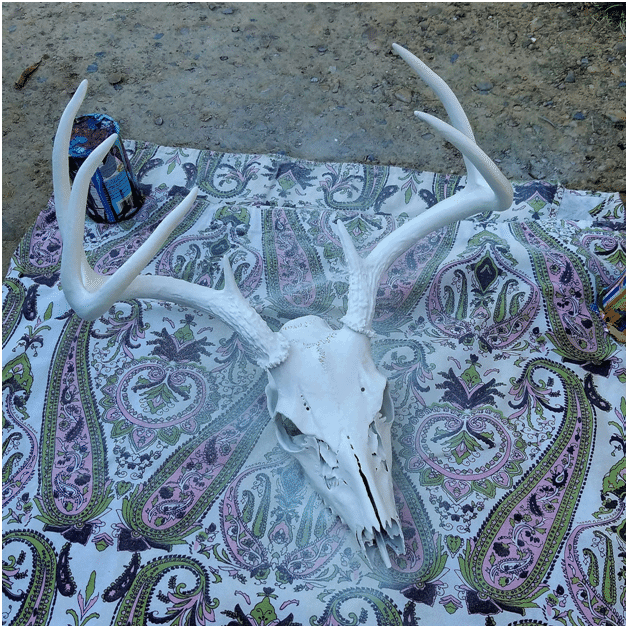 After your skull is a nice bleached color you may take it out and wipe down with an old cloth. Let your skull completely dry for a few days. Use the sun if you would like to speed up the drying process. I used Zinsser 1-2-3 Primer, but most any would work. I suggest the spray due to the little cracks and crevices that you really want to get the primer down in. You may also use Gesso. Make sure to use a small brush for the tiny areas that are hard to get to. When applying the primer I started by doing every angle on one side. After the topside had dried, I then flipped the skull and primed it from the underside. After about three coats of primer, this baby is ready for some paint! It may seem that three coats is a little excessive, it’s not. Bone is very porous and to avoid your paint being absorbed, you need a heavy primer coat. Now the bone is ready for paint! 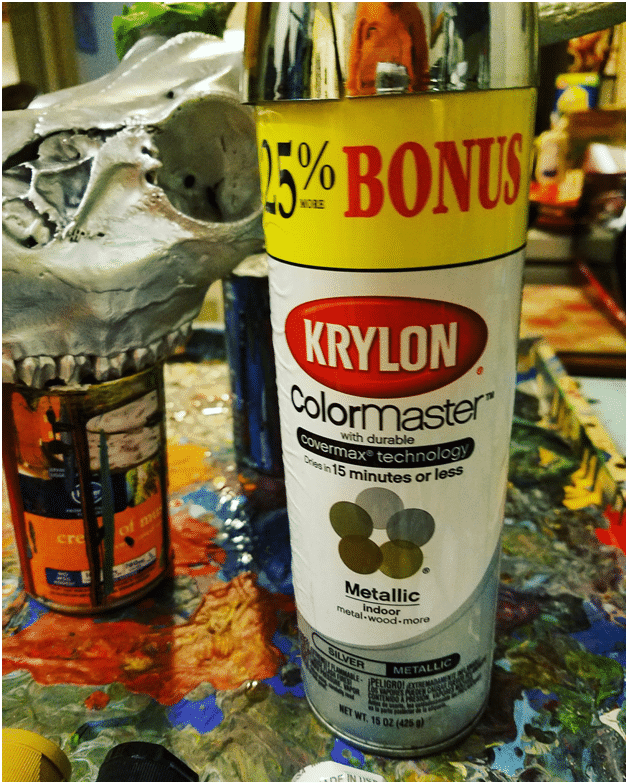 I started by doing a base coat of Krylon ColorMaster metallic silver spray paint. This was a commission for a customer and they really liked the element of the metallic underneath the poured color. 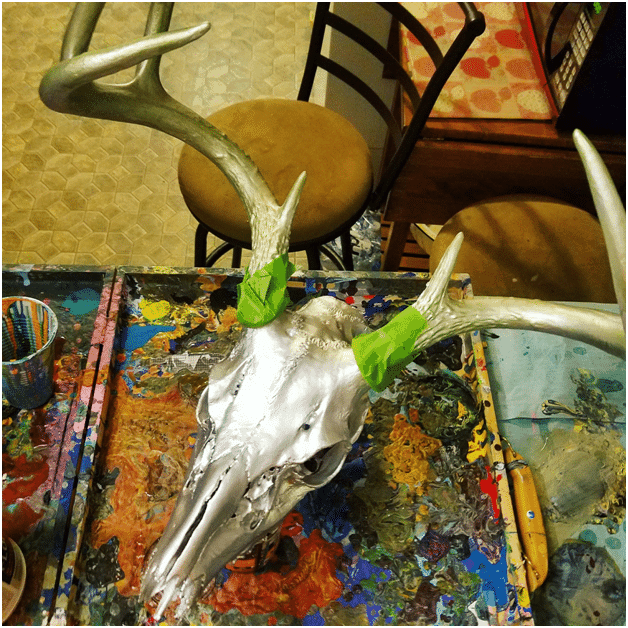 After the basecoat of metallic is dry, I also applied a green patina to the horns with Deco Art Metallic in Festive Green. Using a small rag or sponge, I rubbed the patina onto the horns. The horns are great for patina due to the texture. It gave the horns a natural mossy look. Moss grows in my backyard, giving me inspiration to bring my surroundings into this piece. We are now ready to do the exhilarating part. Lets pour some wine—I mean paint, or both. Anyhow, pictured below is the smorgasbord of paint I used for this piece. You may use any kind you would like. The Golden paint is highflow acrylic and I usually do a one to 10 ratio of the Golden paint to Floetrol. For this project, I would recommend a three to 10 ratio of the Golden paint to Floetrol. 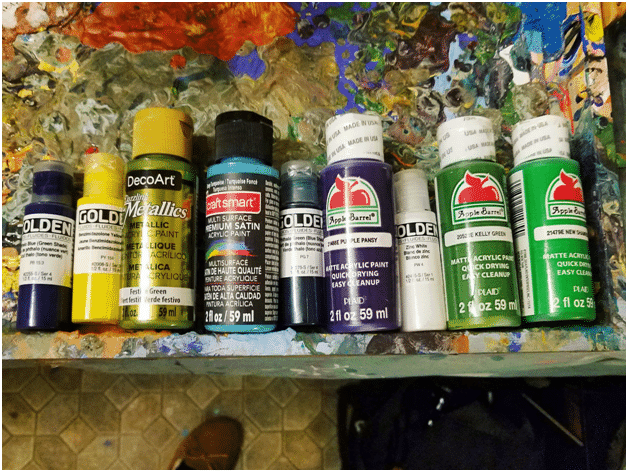 The rest of the paint brands (Craftsmart, Apple Barrell, and DecoArt) I use a 50/50 ratio of paint to Floetrol. Although I would recommend a ratio higher in paint for any 3D project. You want the paint to flow nicely, but you also do not want it to slide right off. After my paint had all been mixed to the desired consistency, I added a small drop of 3-in-1 Silicone to each color. The next step was to layer my paint in one cup. Each color was layered in the cup in order from light to dark. Repeating the layers of paint color twice. Now you are ready to pour your heart out. I used half of the dirty pour cup and let the paint settle, after leaving it for a little, I continued to add small amounts of the dirty pour cup at a time. The details really come out more when the paint sets up. You can really go crazy with 3D objects and give a completely new life to your pour. After letting the skull dry completely for a few weeks, I started the finishing of the skull. I used Krylon Matte finish in the spray can. This topcoat I have discovered will help with absorption of any silicone left in the piece from the pour. The next day I applied Polycrylic with a soft brush to all areas of the skull, once again flipping the skull over to get all angles. After the second Polycrylic coat on both sides were dry, I poured the Polycrylic inside the skull and moved it around to give it an even coat on the inside as well. 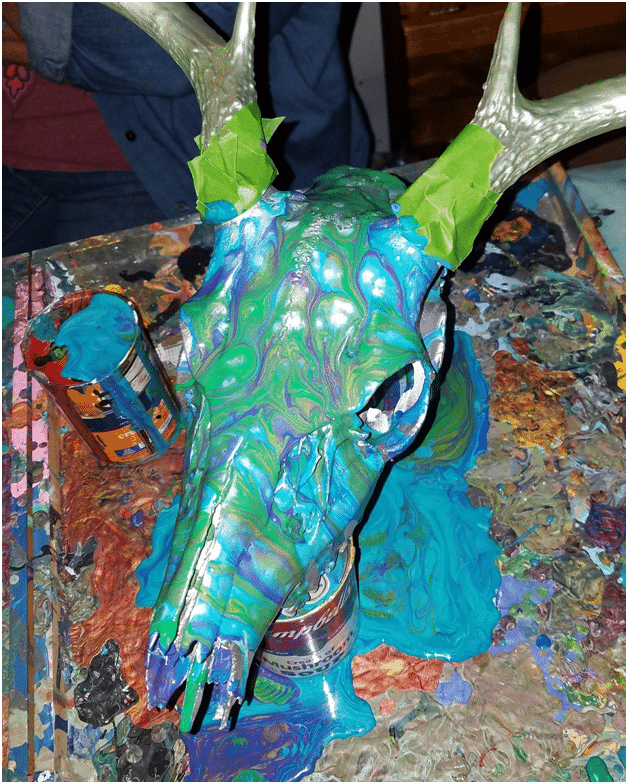 The finished product for this piece was a radiant, sleek skull. It really is not the same in pictures as it is in person. Feel free to leave me feedback and ask any questions you may have! Alisha is a visual artist based in the Blue Ridge Mountains of Virginia. She is a self-taught artist specializing in fluid acrylic painting, artistic furniture, and abstract drawing. 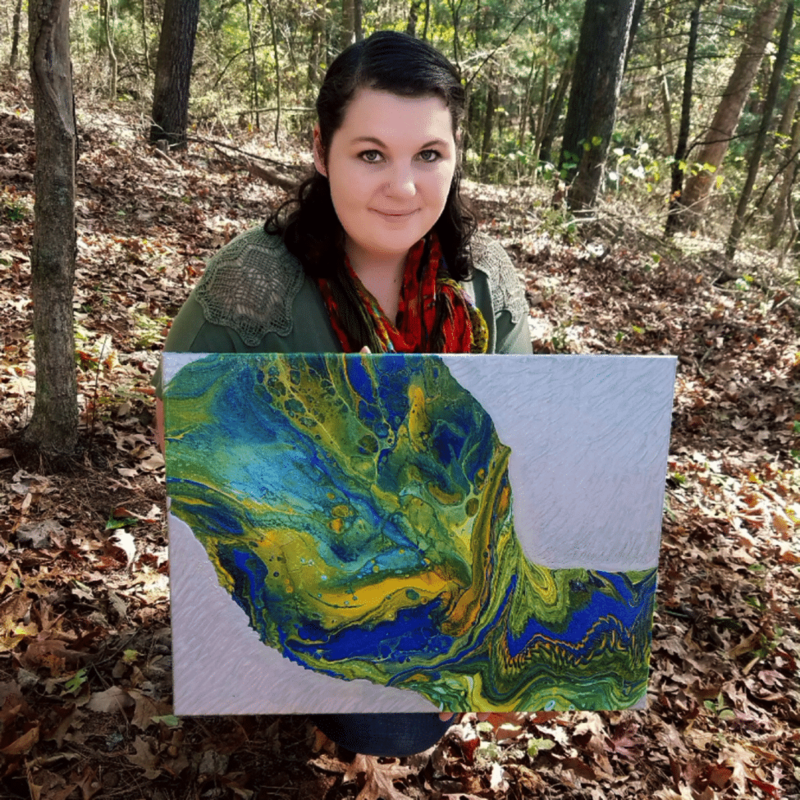 Alisha recently started creating art again after the birth of her son and a battle with postpartum depression. Her work features key themes which explore the associations of color and emotion, namely, the ability of color to inspire and promote positive emotions such as happiness, joy, and wonder. She is a mother, artist, and a mess from time to time.